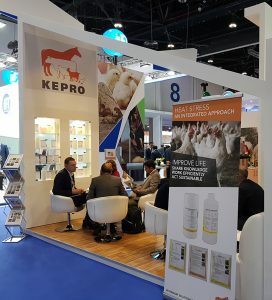 After the successful first edition in 2016, VIV Middle East and Africa took place in Abu Dhabi, United Arab Emirates for the second time from 5 to 7 February 2018. 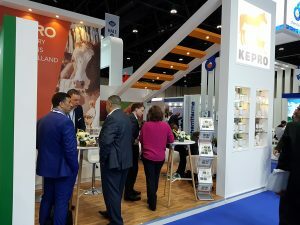 Kepro was present with its own booth. We told our visitors more about our new nutritional and pharmaceutical solutions. Also, our Technical Manager Josje Hakker shared her knowledge during a seminar about the best approach to heat stress. We would like to thank you for your visit. Besides that, we would like to invite you to VIV Europe in Utrecht, The Netherlands from 20 to 22 June 2018. At this exhibition we will present our new Total Farm Management guides. These guides contain all information for farmers about setting up a stable, good management practices and recognizing and treating diseases. Demand yours by visiting our booth. We will be happy to welcome you to inform you about the latest trends, developments and Kepro solutions. If you need more information, please contact us. In the meantime, subscribe to our newsletter to stay updated about the latest developments at Kepro.